nick c wrote: I am not sure what you are stating here? I'm stating that malachite and turquoise are not bone, and that I know of no way that bone can be turned into malachite or turquoise. That said, it seems safer to conclude that these "fossils" are in fact fraudulent. nick c wrote: Of course, skepticism is a good thing, but the fact that it is stone and not bone in no way implies fraud. Then maybe you could explain the process by which bone could turn into malachite or turquoise or both. nick c wrote: Fossilization takes many forms, and one of the common forms would involve the replacement of bone with minerals which form into stone. I've yet to see the case made for any kind of "fossilization", so I conclude every "fossil" is a fraud. This includes "petrified wood" (which are obviously fulgurites and were never wood), "fossil" bones and so on. Until such time as a reproducible method of fossilization of such material is found, I won't waver from my conviction that they're all hoaxes. nick c wrote: The website mentioned that the find was explained as a prehistoric mining accident, that is, a shaft was dug into the ground as humans mined for minerals, and at some point there was an accident burying humans whose remains became fossilized in a pre human strata. This feeble explanation offered by researchers is only necessary if you want to perpetuate the fraud of "fossilization" of animal or plant matter. If you simply conclude they're frauds, and the best evidence that they are hoaxes is that they are malachite and turquoise, you cut off your nose to spite your face. You can't have it both ways, so they simply produce a different timeline to explain it away, rather than draw the obvious conclusion that bone does not turn to stone, no matter how long you wait or where it's buried. This doesn't in any way suggest that these "fossils" are not hoaxes, simply that the researchers "explaining" it don't want to trod on soft ground by brining into question the entire issue of fossilization at its foundation. If you want some examples of "fossils" that are clearly just rocks, I'll see what I can dredge up. Otherwise I'll assume you're convinced by my skepticism. "Marwitt concluded that the bones were unquestionably intrusive burials, probably only hundreds of years old." "Although we could not do any invasive work, we found, as others before us had, that the bones were rather were light-weight and largely modern appearing human bones, except for the green staining." These other sources state quite flatly that the bones are not even fossilized, no surprise, since there is no known mechanism for bone to turn into ANY kind of rock. StalkingGoogle wrote: I've yet to see the case made for any kind of "fossilization", so I conclude every "fossil" is a fraud. This includes "petrified wood" (which are obviously fulgurites and were never wood), "fossil" bones and so on. Until such time as a reproducible method of fossilization of such material is found, I won't waver from my conviction that they're all hoaxes. nick c wrote: Believe what you will. I don't need your permission, but thanks anyway. * They don't deny that the fossils are real. Instead, they date them as young. Since conventional dating relies on the improbable assumption that there have been no cataclysmic events that would have changed the amount of C14 in fossils, there's no reason to accept their dating. Could bones turn to malachite or turquoise in 200 to 1500 years? Probably so under cataclysmic conditions. But I don't believe there have been such conditions that recently in Utah. * A net search turns up a number of "turquoise fossils" and "malachite fossils". Here are two quotes from two different websites that sell them. Fossil ring has a turquoise stone on an adjustable silver brass band. Stone is fossilized coral from the Caribbean Sea. Vintage bright turquoise fossil stone beads! Fossil stone is unique to Taiwan and is a dense limestone containing microscopic marine fossils. Because of the nature of this material, no two beads are alike and the patterns and colorations are unique to each bead. * Thanks for the extra evidence, Great Dog. ... An almost unbelievable piece of evidence remains for our contention that Earth has been visited by catastrophes that reshaped its continents and, perhaps, opened the Atlantic Ocean basin within the memory of human beings on this planet. The Scandinavian Peninsula may be the fossilized vortex of a helical plasma beam that engulfed Siberia, Finland, Norway, Sweden and other locations in a cloud of electric fire powerful enough to change the world. - In a previous Picture of the Day article, polar vortices on Mars were presumed to be the remains of plasma beams that did nearly identical damage to the Red Planet. The northern latitudes were simply wiped away, leaving nothing but a blasted desolation many kilometers below the mean elevation of the planet. A side-by-side comparison of Scandinavia and the North Pole on Mars is revelatory. A giant lake-filled caldera in Mongolia could indicate electric arc machining on a massive scale. ... When Bob Ballard explored the bottom of the Black Sea, a semi-enclosed lake, he was surprised to find little sediments and even more surprised to find evidence for an inundated civilization. Similarly, Uvs Nuur is free of deep sediments, although it is supposed to be a remnant from a vast inland ocean that covered most of Central Asia. - Rather than being formed by melting glaciers and 12,000 years of time, it seems possible that the entire Mongolian lake complex, stretching for a thousand kilometers across Asia, is the result of gigantic electrical discharges from space. - Electrical theorists have postulated unstable planetary orbits in the recent past, causing periods of intense plasma interactions. When lightning bolts with energies in the billions of watts strike the Earth, rocks are vaporized and blasted into space, leaving pyramidal mountains and deep, wide holes in the strata. A signature of that activity would be lack of debris covering the surrounding landscape, and smooth valley floors. The excised material would have been removed in a way that is similar to plasma surface cleaning. - Other Pictures of the Day articles have described events on Mars that carved out Arabia Terra, Valles Marineris and other structures. Now we ask once again whether major features on Earth, including the below-sea-level lakes of Asia, were cut by cosmic thunderbolts. The most important problem with the theory of plate tectonics is that the power required to move continental landmasses around has not been adequately explained. Thermal convection is said to circulate heat energy from the Earth's interior, but there has been no process developed for how the spreading began. Why did it take almost 2.5 billion years for the crust to begin cracking and melting? * Actually, I believe Cardona's idea of Earth's rotation stopping by electric pressure during past Saturn flares would explain continental drift. Some of the world's most unusual geography can be found across North Africa. Could it have been created by massive electric discharges in the recent past? ... One of the more surprising aspects of the Jebel Uweinat uplift region, in which Jebel Arkenu can be found, is how closely it resembles the Western Desert in the United States. One example of that similarity is Shiprock, New Mexico. ... If the mesas, gullies, pillars, spikes, and ridges have all been exposed to wind and rain for millions of years, why are they still so sharp, steep and well-defined? ... Jebel Arkenu itself is notable for its spiral-shaped interior. There are no known natural forces other than spinning electric vortices that can excavate spiral forms with uplifted central peaks. Many of those are found on the Moon and others have been observed on Mars. Since the primary thesis put forward by Electric Universe adherents is that a cataclysmic encounter with some other electrically charged body took place less than 10,000 years ago, or perhaps sooner, then the "fresh" appearance and lack of erosion is explainable. Last edited by Lloyd on Wed Mar 07, 2012 5:31 pm, edited 3 times in total. Lloyd wrote: * They don't deny that the fossils are real. Instead, they date them as young. Yet more proof that wikipedia is crap. Other sources say these bones weren't even fossils, just stained by copper oxides. Lloyd wrote: * A net search turns up a number of "turquoise fossils" and "malachite fossils". Here are two quotes from two different websites that sell them. One of the passages you quoted identifies "fossil coral" as turquoise, highly unlikely. The other identifies their turquoise as "limestone". In any case, until some mechanism for how bones (or anything) could turn into turquoise, I'll continue to conclude that turquoise (and malachite) "fossils" are fake. Stalking said: In any case, until some mechanism for how bones (or anything) could turn into turquoise, I'll continue to conclude that turquoise (and malachite) "fossils" are fake. * Why do you mention that to us? Should we be impressed by your conclusions? Lloyd wrote: Should we be impressed by your conclusions? Sure, I mean I don't see why not. It impresses me when I say something brilliant. Thanks to Lloyd for making me aware of this thread. 1. Stalking doesn't know what he is talking about when he speaks about fossils, particularly petrified wood. 2. I have personally spent hours examining and collecting specimens of petrified wood from interlayered sediments between the lava flows of Eastern Washington. These specimens I took from buried/exposed petrified trees of about a meter or more in diameter from the top of Frenchmen Hills south of Vantage, where also the Gingko Petrified Forest Park can be visited by anyone. Of interest to me was that the woody core materials were less consolidated than the outer layers and were the consistency of toothpicks. Looking at the broken cross sections of the petrified logs, one can easily observe the ringed structure of the wood, and closer microscopic examination shows individual cell features. The petrifying material is opal [not the fiery kind], a silicate common in the Columbia River Basalts there. Opal is formed from aqueous silica. 3. I have also taken numerous samples of diatomaceous earth and opal from the Quincy diatomite beds a few miles north of there. Of interest here is that the diatomite is unconsolidated material [indistinguishable from chalk in appearance, though silicate in composition], yet contains lenses of opalized rock [sections as large as a meter or more in diameter] formed from what I could tell as pressurized steam rewelded the diatomaceous sediment. The geologic story here is of lava flows interbedded frequently with sediment bearing overflows of ocean flooding. These sedimentary inter-layers range from gravels to sands, clays, and the above mentioned diatomaceous beds. The wood found in most of these varying layers is petrified with silica, but notably in one fairly deeply located clay layer the wood was partially carbonized [nearly to coal] but not petrified. That fossil sample is found at the interpretive center in the Petrified Forest park. 4. I've been to the Petrified Forest of Arizona several times. Stalking should go there [and rethink his life]. 5. I have a sample of fossilized dinosaur bone in my collection, petrified with a cherty mineral. 6. I also have a sample of a small mammal coprolite, petrified with limonite [an iron oxide]. 6. I have not before heard of the process by which bone could be turned to malachite, although it does seem reasonable that bone material could be stained by or infused with malachite leeching in the country rock. But as has been the case in various dinosaur finds, fossilization comes in various stages, from soft tissue preservation all the way to full petrifaction. 7. I am personally familiar with Donald Patten, and am confident he is a bonafide researcher. 8. I agree 100% with Nick's assessment of the Malachite Man findings. If there had been any evidence of these skeletons being faked, the "standard geologists" of Wikiworld would have been all over it... but they weren't. 9. HOWEVER, I am as skeptical as Stalking of the malachite femur pictured... a very short Google Image search returned a number of malachite carvings some of which are of human bones [a skull stands out notably]. 10. That being conceded, petrifaction is a laboratory reproducible process, taking hours, versus millions of years, to produce indistinguishable results, using saturated silica solutions and kitchen oven temperatures. * Thanks a lot, Web, for all that info. You said: The geologic story here [near Vantage in central Washington] is of lava flows interbedded frequently with sediment bearing overflows of ocean flooding. These sedimentary inter-layers range from gravels to sands, clays, and the above mentioned diatomaceous beds. * That's interesting. It sounds like you're implying that there were tidal waves and lava flows occurring, where lava was laid down first, then a tidal wave buried some of it under a layer of diatomaceous earth, gravel, sand and clay, including also trees, then successive layers of lava and tidal wave sediment were laid down over the first two layers. I suppose gravels and sand came from the coast, clay and trees came from land near the coast and diatoms came from the ocean. I suppose the lava came from the volcanoes along the coast, as well as from flood basalt. Is there a way to distinguish which source any particular lava came from? * Do you know of any websites that give a good explanation of what likely actually happened and how long it took? Like, do you have an idea how long the lava flows lasted? RHINOMORPHIC LACUNAE, Mel Acheson - Long ago, a flood of molten basalt spread over eastern Washington State and down the Columbia River valley to the sea. Later, the river cut a new channel (or flowed into a new channel), resulting in today's Columbia River Gorge, with high lava cliffs on each side. - In one of those cliffs, a group of geologists discovered a cavity with bones at the bottom. The bones, they found, were those of an extinct species of rhinoceros. It was then they realized the cavity bore the shape of that rhino. The flooding basalt had overrun the rhino and had solidified around its body. The body had decayed, leaving the bones, and erosion later had exposed the cavity. - The moral of this story is that you shouldn't leave the rhinoceroses of assumption to graze in the meadow of the unconscious when the flood of molten imagination lays down a new theory. When the new ideas crystallize, they will encase the old assumptions, which will leave rhinoceros-shaped voids of explanation in the new theory. * Have you heard of any other animal remains or fossils in the flood basalt and interbedded strata? Do you know if those rhino bones were fossilized? Oh, I see here that the flood basalt came from eastern Washington, not the volcanoes near the coast. Lava began flowing in the Columbia Basin about 17 million years ago and continued until about 6 million years ago. In all, there may have been 300 individual outbreaks. Each lava flood was separated by thousands of years in which nothing happened. * Yes, nothing happened, no erosion either, therefore each flood wasn't separated by thousands of years, but by days, weeks, or months, I'd guess. You said: The wood found in most of these varying layers is petrified with silica, but notably in one fairly deeply located clay layer the wood was partially carbonized [nearly to coal] but not petrified. That fossil sample is found at the interpretive center in the Petrified Forest park. It also says: At some point during the Miocene Epoch the Columbia Basin was home to an aquatic rhinoceros, huge turtles, small three-toed horses, deer, bear, camels and elephants. The late Miocene/early Pliocene period leaves evidence of horses, raccoons, badgers and coyotes. * Do you know if that wood has be carbon-dated? You said: 9. HOWEVER, I am as skeptical as Stalking of the malachite femur pictured... a very short Google Image search returned a number of malachite carvings some of which are of human bones [a skull stands out notably]. * If Patten is an honest researcher, as you think, then why are you skeptical about the malachite femur he apparently saw embedded in the rock stratum? Do you think you'd be able to make a malachite femur that way yourself? webolife wrote: 1. Stalking doesn't know what he is talking about when he speaks about fossils, particularly petrified wood. webolife wrote: 2. I have personally spent hours examining and collecting specimens of petrified wood from interlayered sediments between the lava flows of Eastern Washington. I suggest you are a victim of confirmation bias. You believe it is "petrified wood", so no amount of evidence is going to shake your faith. webolife wrote: Looking at the broken cross sections of the petrified logs, one can easily observe the ringed structure of the wood, and closer microscopic examination shows individual cell features. You saw what you wanted to see, what you expected to see. When I look at specimens of "petrified wood" I see what's there. webolife wrote: Opal is formed from aqueous silica. I defy you to demonstrate this process in a lab. webolife wrote: 4. 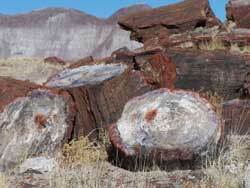 I've been to the Petrified Forest of Arizona several times. Stalking should go there [and rethink his life]. What you are calling a "Petrified Forest" is nothing but a shared delusion, like the jesus myth. I'm not even going to get into a shroud-of-turin-like debate about whether or not jesus actually wore is because jesus is fictional. So it "petrified wood". You looked at massive fulgurites from electric arcs. webolife wrote: 5. I have a sample of fossilized dinosaur bone in my collection, petrified with a cherty mineral. More confirmation bias. You see what you want to see. webolife wrote: 6. I also have a sample of a small mammal coprolite, petrified with limonite [an iron oxide]. Hahaha right petrified dinosaur poo. Classic. Please demonstrate in the lab. webolife wrote: fossilization comes in various stages, from soft tissue preservation all the way to full petrifaction. webolife wrote: If there had been any evidence of these skeletons being faked, the "standard geologists" of Wikiworld would have been all over it... but they weren't. Many sources, including Wikipedia, state that the bones are not even fossilized, just stained by copper. webolife wrote: 10. That being conceded, petrifaction is a laboratory reproducible process, taking hours, versus millions of years, to produce indistinguishable results, using saturated silica solutions and kitchen oven temperatures. Abjectly false. The so-called "petrification" processes demonstrated in a lab involves soaking material in acid to make it rubbery and spongy, then chemically depositing minerals in the rubbery lattice. And the results are nothing like these fulgurite samples picked up off the ground known as "petrified wood". * Stalking, your statements aren't impressive, because they offer no explanations of anything. 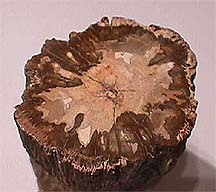 If you can demonstrate how fulgarites can acquire tree rings, cellular structure etc, you might start to sound a little believable, but we already have evidence that petrified wood can form from lightning strikes, since that's been observed and photographed, i.e. a tree was struck by lightning and its root became petrified wood. This was discussed on the Mummified Dinosaurs thread. Lloyd, thank you for your as usual thoughtful questions. I have developed a comprehensive catastrophic view of Washington geology since majoring in earth science at the UW in the 70's, and since then traveling extensively throughout the state. Yes I think a repeated tsunami scenario is likely. We have massive large-scale repeated volcanism in which lava beds are laid directly [as you said without intermediate erosion] on top of each other, and in many places these same layers are found with interbedded sedimentary materials of various sorts, including [I forgot to mention earlier] coal beds on both sides and running parallel with the Cascade mountains. The lava flows are nearly of the same composition and origin, mostly indicating ocean floor type parent magma. This makes it pretty clear that there were none of the current tectonically formed mountains in place prior to the beginning of these flows, as then the lavas would be more of the andesitic variety than of basaltic. There are notable exposures of pillow lavas [my favorite stopping point is at Ryegrass exit on I-90 approaching Vantage from the west] where it is clear the basalt flowed into one of the water bodies then rapidly cooled to form the typical "pillows". Mountain building, both of the coastal Olympics and of the Cascades, happened after most or all of the flows were in place, as indicated by the fact that the lava flows to the east tilt upward as you approach the Cascades, and also by the interlayering of basalt [especially pillow basalt] and sedimentary strata in the Olympic mountains and along the coast to the west. This predominant interlayering of igneous and sedimentary materials throughout Washington contrast sharply to what Michael Steinbacher says about the duning of various Utah sediments, which are typically topped on many mesas by basalt. His rock-melting plasma flows cannot explain the formations seen throughout my state. Respectfully, I conceded early on in Starbiter's thread that duning was responsible for many of the formations in the Southwest, but I still doubt that his hot auroral plasma flows could produce the basalts he finds there. 1. Coulee walls are not only sheered straight away but typically show the columnar faces of the somewhat [but not completely] cooled basalt. The joints between columns make great places for water to fill, but combined with the still oven hot temps, produce steam blasts that push away and/or destroy the columns being exposed. 2. In addition this area is called the potholes, for the numerous spots among the coulees where deep pits have been similarly blasted away by the inflowing water being turned to explosive steam. The standard explanation is that a gradual process of cavitation produced these deep pits, but I've studied several of them and I don't buy it... the bottoms of the pits are often a greater diameter than the upper parts, which I can't see being produced by slow cavitation... besides which the floods were catastrophically quick -- when was there time for this gradual cavitation to take place? 3. JJohnson [Jim] and Dotini [Steve] and I had the opportunity this past summer to hike over to the Blue Lake Rhino described in your post. When this mold was found about a 100 years ago, there were still bits of unpetrified bones and teeth in the cavity, further attesting to the recentness of this event, IMO. Regarding Patten, I believe he is sincere and honest; I'm confident the picture of him examining the Malachite Man fossils in situ is authentic, but I have some reasonable doubts about the femur picture and the authenticity of the caption that accompanies it. I am easily convinced of the Cretaceous setting of the Malachite man fossils, and the only reason anyone doubts that is their evolutionary time scale bias. I've read pretty much everything ever written about all of these claims, and believe much of the work on these projects has been genuine, but interspersed every time are wishful-thinkng or mis-directed hoaxers who do damage to the reputability of the actual research. So I'm cautious and skeptical of grasping at non-evidence to support or try to strengthen the real stuff. My integrity is more important to me than my worldview. Fulgurites don't acquire tree rings and cellular structure until you add your preconceived notions and your faith-based belief that these objects were once wood. As for lightning strikes turning wood to stone, it's utter nonsense.